I was reminiscing the other day to my gathered grandchildren about the annual childhood vacation journeys my family used to make from wherever we were living at the time to my paternal grandparents’ home in central Kentucky. Dad let us take turns as navigator in the shotgun seat, getting us from point A to B in a day’s drive, using nothing but those “little blue roads” through the rural countryside he loved so much. Occasionally one of us kids would get us good and lost, then the next in line would have to find a way out. He was never in a big hurry, we often spent more days than necessary getting to Grandma’s house. One of the things I recall most fondly were the painted advertising barns we’d see along the way. “See Rock City” barns no matter where we were or how far it was from there to Chattanooga, Tennessee. Ubiquitous tobacco barns in Tennessee, Virginia and Kentucky painted to advertise for Mail Pouch or Red Man or some other cigarette, chew or pipe tobacco. 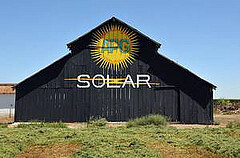 Some very unique painted barns advertising for local or national businesses. We used to keep a page of the trip log for listing those, along with each eagerly anticipated Burma Shave series of one-word jingles and the usual list of state license plates seen along the way. Those old ad-barns are quickly falling into distantly remembered history, as tobacco bases become increasingly rare and as the barns themselves deteriorate. Some have been salvaged as ‘conversation piece’ paneling for fancy rural log McMansions, pulling in a pretty penny for those who dismantle rotting outbuildings in a newer generation. In an age of interstate highways lined by boring billboards, seeing a unique working barn with a real advertisement on it is becoming a rare occurrence. Would it surprise you to find that barn painted advertising is making a comeback? It surprised me, but then again, I don’t go far from home very often, and then mostly via interstate. But barn painted advertising still has its uses, and can return money to a landowner equivalent (or better) than from simply renting space for a billboard to be erected. All it requires is that the farm/homestead have frontage on a well-traveled roadway, and a good sized barn that can be easily seen from that roadway. Thus ‘selling’ the side and/or roof of a barn or other large outbuilding to a company for advertising could possibly be a good source of ‘extra’ income for homesteaders to think about. You can do this yourself, though it wouldn’t be as quick a turnover to income as going through a company that contracts ads for billboards and such, that might consider your barn. For local companies, check with advertising directors to pitch your location and visibility of your outbuilding(s). This can work for regional companies as well, but national companies generally go through those advertising firms. You could try both, take the deal that offers you the most for your offered advertising space. Lucky homesteaders may in this way earn extra income just for having outbuildings visible to the public, and in return get a showpiece of a barn that can someday be worth even more as salvage! And don’t forget to consider that you can always advertise on your visible barn/outbuilding your own farm logo if you belong to a CSA [Community Supported Agriculture] cooperative, offer Agri-tourism attractions and/or B&B accommodations, or deal directly with the public for U-pick or fresh harvest produce, eggs, honey and/or meat. In such ventures advertising pays, and being visible to the public can only help. 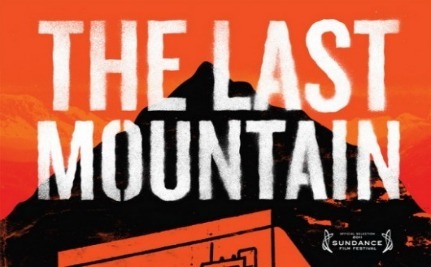 The Last Mountain is a new documentary film detailing the gross environmental destruction of mountaintop removal [MTR] coal mining, featuring interviews with some of the activists most involved in trying to save the beautiful Appalachian mountains from King Coal. The subject of MTR has been covered previously on this blog in a number of posts, including EPA Halts MTR Permits for Review, with information about EPA administrator Lisa Jackson’s attempt to slow the destruction – a task that has been less than successful due to the power of King Coal. Old King Coal vs. Reality talks about some of the legislative actions attempted by states impacted by MTR to prevent the continued destruction of mountains and entire watersheds – which have also been less than successful. Old King Coal, a Filthy Old Soul described some of the environmental horrors being visited upon the land, water and people of the Appalachian highlands by a coal mining method that has succeeded in eliminating 40,000 jobs for those same people while burying more than 2,000 miles of once pure mountain streams and flattening 500 mountains. The film’s fine website includes links and outlines of ways you can help end mountaintop removal mining, something people even well outside the Appalachian region should support. We must not allow these most ancient and abundant mountains on earth to be utterly destroyed to serve the bottom line of criminal enterprises like Massey Energy – which racked up more than 60,000 environmental violations between 2000 and 2006 and criminal charges for violations leading to the explosion at its Upper Big Branch mine in West Virginia that killed 29 miners in 2008. It’s not easy to stand against King Coal. Just in the last two years more than 200 people have been arrested in civil disobedience protests just in West Virginia and Kentucky, two states that are suffering the bulk of destruction and the loss of more than a million acres of forest and dozens of towns. This extreme form of coal extraction has turned the coal fields of eastern Kentucky, West Virginia, eastern Tennessee and southwest Virginia into a moonscape of barren, toxic wasteland. What needs to happen, and needs to happen soon, is for so many people to make a stand that the unholy alliance of King Coal, state politicians on the take and law enforcement are forced to step aside. Please see this film. Arrange a showing (can be done through the website) and invite all your friends and neighbors, maybe your co-workers and boss. Join or support some of the alliance groups that have supported the production of The Last Mountain. Some of these are listed and linked below. If the Appalachians are destroyed for their coal thousands of homesteads will be destroyed along with them, along with the loving work all those homesteaders did to develop their little pieces of heaven on earth for themselves, their families, and all of us who are making the same effort in our own lives, wherever we are doing it. We all must stand with the people of Appalachia against the forces of destruction-for-profit. Thanks, Homesteaders! Let’s get together and end this outrage now, not later!